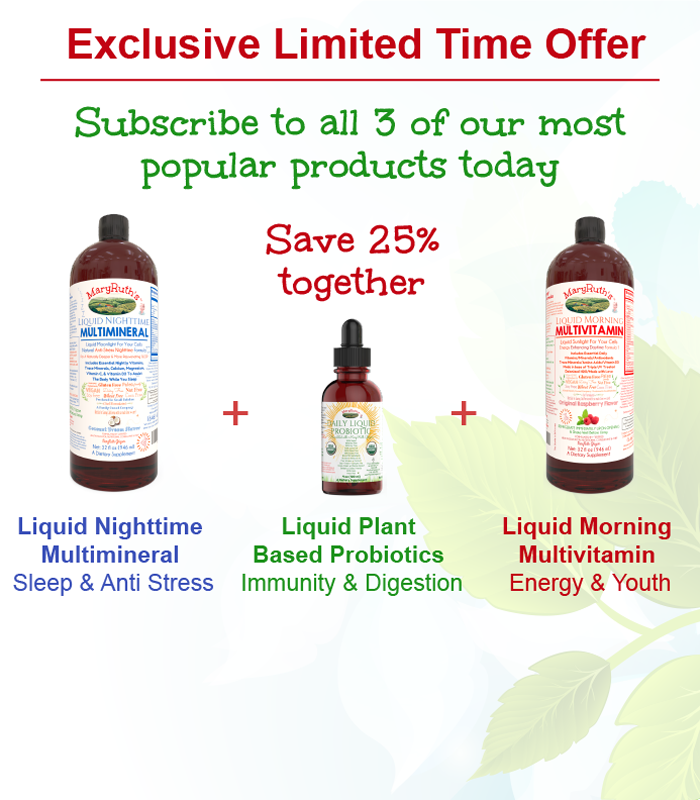 Support the Immune System and Digestion with our USDA Certified Organic Liquid Probiotic. Our probiotics are raw, plant-based, highly potent strains sourced directly from Mother Nature: made with water and a proprietary blend of three organic grasses. Each bottle comes with 40 servings. These liquid probiotics increase energy levels, assist in controlling digestive problems, enhance weight loss & weight maintenance programs, suppress bad bacteria, fight yeast and fungal infections, improve immune function, reduce cholesterol, and help with liver function. Lactobacillus-Acidophilus, L-Rhamnosus, L-Salivarius, L-Casei, L-Plantarum, Lactococcus-Lactis, Streptococcus-Thermophilus, Bifidobacterium-Bifidum, B-Lactis, B-Infantis, B-Breve, and B-Longum in an enzyme-enriched substrate with water and a proprietary blend of three organic grasses. How to use: Take the recommended dose by itself or add to any drink, smoothie, recipe or MaryRuth’s Multivitamins! Store in a cool, dry place. No hard to swallow pills! This Liquid Probiotic is easily absorbed and, unlike solid probiotics which are treated with heat and chemicals, our probiotics are always in their raw state, ensuring shelf stability & maximum potency. Q: I’m not feeling a difference when taking this, why? A: You ask a good question! About 50% of our customers see immediate physical results whether it be less bloating, better digestion, or better bowel movements. However, a large portion of our customers do not feel a difference at all. Most of these changes can be strictly internal and nothing you can “feel working.” Regardless, please reach out to us if you are not satisfied with the product. Q: How should I use this? Can I take it with drinks or food? A: Ideally, the probiotic would be taken on an empty stomach in the morning. It can also be taken before meals if you have forgotten to take it in the morning. You can add the probiotic to any amount of liquid that you prefer. Q: Does this need to be kept in the fridge like other probiotics? A: Our Probiotics have been tested for efficacy in high/hot & cold temperatures; the efficacy of the product is not affected at all! Our probiotics are Soil-Based Organisms (SBOs), which are unique in the fact that they are resistant to heat, and are shelf-stable. Q: Can my kids use the Liquid Probiotics too? A: In general, everyone — children and adults — should check with their physician, pediatrician, or healthcare professional before beginning any new wellness supplement to make sure the supplement is suitable for their health. Your physician, pediatrician, or healthcare professional knows you and/or your children best, knows what other supplements or prescriptions you or your child are already on, as well as knowing if you, or your child, are facing any health challenges. We recommend that the children’s physician, pediatrician, or healthcare professional approve all new wellness supplements. If your child’s physician, pediatrician or healthcare professional feels the probiotics are suitable for the child, we recommend considering the dosages, broken down by age, on the box and label of the probiotics. Additionally, your respective physician, pediatrician or healthcare professional can assist you in determining the appropriate dosage for your child. I ordered this item as almost an afterthought since it was offered in a bundle discount with the morning and evening liquid vitamins that I was already ordering, and now I'm hooked. I love that I can just add it to my water in the morning, and that it's plant based! The bottle lasted a little over a month and I love the glass bottle with dropper design. When using it regularly, I notice a huge improvement in my stomach functions and my complexion. I also tried adding a couple drops to a moisturizing mask a couple times a week to help re-balance my skin. I have loved this probiotic ever since I tried it over a year ago! It was a recommendation from “medical medium” author. I love that my whole family can take this and it tastes like water. It’s also nice it doesn’t have to be refrigerated. I don’t even have to think about ordering with the convenient autoship program. I highly recommend if you need some probiotics in your life, and really who doesn’t these days? The best ingredients sent from above!